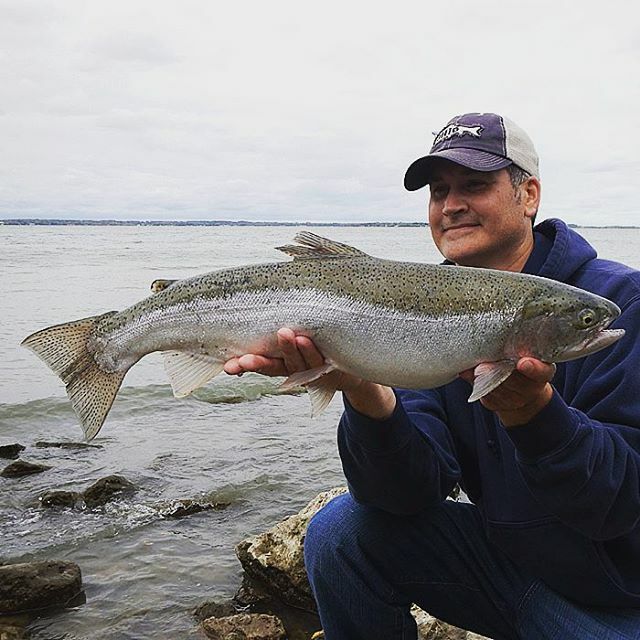 Lake Erie Shoreline, OH – There are many patterns or specific seasonal efforts fisherman can try on Ohio’s north coast. 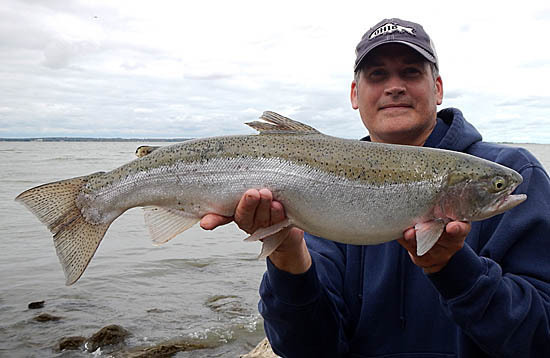 In the fall, this includes targeting Steelhead that stage in and around the mouths of tributaries before committing to their upstream migration. Many of these areas have public access in the form of piers/parks, and they become dotted with anglers hoping to entice a fish to bite. Whether staging or a fish simply making its way into the tributary, the baitfish are often near shore which brings the trout within casting distance. Most successful anglers throw an assortment of spoons and spinners, even some crank baits designed to mimic the forage fish. At times, even perch anglers using live shiners will encounter a trout. As for me, I find myself choosing spoons and spinners in a plain metal finish, most of the time. Now that I’ve provided a little background, let me proceed to my report from a recent trip. Mornings and evenings are generally the best times and my intention was to arrive to the water pretty early. Things didn’t go as planned when I realized I forgot my fishing rods. You read that correct, I forgot my ! @#$% fishing rods! I have no idea how one does this, but I did it. I lost considerable time not just with the return home, but all the time I spent wondering if it would be faster to just buy a cheap rod somewhere close and head to the water. When I did finally make it to the water (with gear), my mood was pretty bad. I am a firm believer that mindset, attitude, and confidence can help you catch fish, or not. I tried to focus on the positives such as even if I didn’t catch fish I was at least fishing and the fact that it was overcast. I have had many a great day when the sky looked the way it did. Sadly, the first few hours my blood pressure was still high and I spent more time changing lures than keeping one in the water. I wanted to punch a well meaning passer-byer that offered commentary about how the wind wasn’t coming from the right direction and the lack of recent success by others. When you combine everything from the day and add the fact that I always put a little pressure on myself by having this blog and wanting to make enough nice catches to keep people engaged and be esteemed as a relevant Ohio angler, I truly wanted to leave. At some point, the therapeutic component of the water kicked in before a decision to quit was realized. Those of us that love to stand in or around water, cannot deny the healing effect it has. I took some deep breaths and thankfully some correct perspective set in. As my new calm was established, I reached for a 2/5 oz. 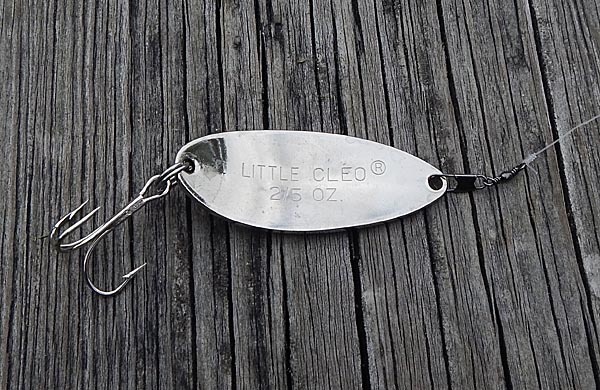 Little Cleo spoon in an all polished metal finish. A lure I have caught countless fish on that gives me complete confidence. I looked at my phone for the time and told myself there is absolutely no sane reason not to fish this for an hour. I stopped messing with tackle and every other item that was distracting me, and simply fished. Fifteen minutes later I would nearly have the rod ripped from my hands. A large hungry Steelhead inhaled the spoon no more than 10 feet away from me, and took off in the opposite direction making my drag scream. Steelhead are known for their fighting ability and this one was as feisty as I have ever encountered. Only one jump, but multiple changes in direction and one blazing run at me where I had to catch the line up to the reel. At least 3 times I got the net close and the fish would rebound with another run. The fish also shook it’s head the entire time and I was praying it wouldn’t work the lure free. After what seemed like an eternity and I have no idea in real time, the fish began to tire and I was able to guide it into the net. Once in the net, another explosion of energy from the fish, but victory was mine! The adrenaline rush of catching a special fish is incredible. No matter how many fish I’ve caught, that feeling never gets old. There were a lot of lessons I learned today, and had I let the stress of the day get the best of me, I might have cheated myself out of that great feeling and the awesome memory I ultimately left with. In time, I will forget all the drama of the day but I will never forget any detail of catching that fish! I know it is cliché, but clearly, “Don’t ever give up!”.